VATICAN CITY (Reuters) - Father Ernest Simoni, a 88-year-old Albanian, was watching Pope Francis on television this month when, to his astonishment, he heard the pontiff mention his name. Francis announced that the simple, white-haired Roman Catholic priest, who had spent many years in jail during Albania's communist dictatorship, was to become a cardinal. It was the first that Simoni, or any of the other 16 new cardinals named by Francis at the same time, had heard of their elevation to the prestigious rank. "I did not believe either my ears or eyes," Simoni told Reuters in Albania. "The pope said it, but I could not believe it. 'Can he be talking about another Ernest?' I said to myself." But more significantly, the pope had also kept nearly the entire Vatican hierarchy in the dark about his decision, which he announced on Oct. 9 to thousands of pilgrims. The episode illustrates how Francis has used his own distinct management style to try to shake up the Church since his election in 2013. He is keeping his cards close to his chest as he tries to push through a progressive agenda to make the Church more welcoming in the face of conservative opposition. Interviews with a dozen current and past Vatican officials and aides paint a portrait of Pope Francis, a Jesuit who turns 80 in December, as eschewing filters between him and the outside world. He carries his own black briefcase, keeps his own agenda, and makes many of his own calls. In contrast, his two immediate predecessors, Benedict XVI and John Paul II, worked hand-in-hand with the Vatican bureaucracy, which is known as the curia. Behind Francis's approach is a clear mandate, received from the worldwide cardinals who elected him in 2013, to overhaul the curia. Over the decades the Vatican's administration has collected some of the Church's most orthodox officials, partly because of the lieutenants that Francis's two highly-conservative predecessors called to their entourages in Rome. As a result, Francis believes that only by reducing the power of the curia – including surprising it on some decisions - can the 1.2 billion-member Church embrace those who have felt marginalized, such as gays and the divorced. The approach has scored Francis some victories, such as bypassing conservative bishops to streamline the procedures by which Catholics can obtain marriage annulments. There have also been setbacks, such as putting too much power in one cardinal's hands to resolve financial problems and later having to rein him in. Some internal critics say he relies too much on snap judgments and others have urged greater transparency. They say his decisions to set up new structures, such as an economy ministry and an external advisory council of eight cardinals from around the world, were divisive and that he could have enacted change by putting new people at the top of existing departments. One of the most striking differences between Francis and his two predecessors is that it is virtually impossible to determine who, if anyone, is really close to him. The personal secretaries of Benedict and John Paul - respectively Georg Ganswein, now an archbishop, and Stanislaw Dziwisz, now a cardinal - were always at their side and became celebrities in their own right, the powerful gate-keepers to get to the pope. By contrast, few people know the identities of Francis's two priest-secretaries - Father Fabian Pedacchio Leaniz from Argentina and Father Yoannis Lahzi Gaid, an Egyptian. Both have other part-time jobs in the Vatican and do not appear or travel with him. "He does not want any filters," said a person who knows the pope well. "Sometimes he will tell one of his secretaries 'so-and-so is arriving in a few minutes' and that is the first they hear of it. Sometimes he tells one without telling the other." This person, like most of the others interviewed for this article, has had direct dealings with Francis and all spoke on condition of anonymity as they were not authorized to talk to the media. This year, an Argentine visitor told a guard at a Vatican gate that the pope was expecting him. Phone calls had to be made to determine he was not a prankster. The pope had not told anyone he had invited the visitor. One person close to the pope said he likes to manage this way because it gives him freedom to bypass rigid channels of communication and makes it impossible for anyone to become indispensable, as top aides of previous popes did. Francis likes to break rules and then change them once the shock has died down. Two weeks after his election, he included women in a liturgical service open only to men. Later, he ordered that the rules be formally changed worldwide. 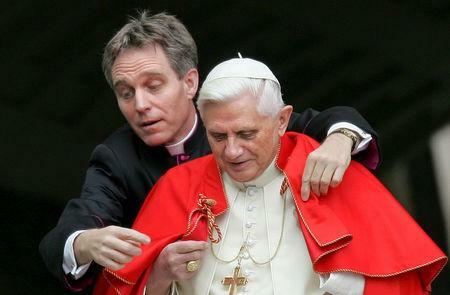 Pope Benedict's sudden resignation in February 2013 brought to a climax one of the most turbulent periods in modern Vatican history, including the arrest of his butler for leaking documents that exposed corruption and cronyism. Francis watched from afar as Benedict's papacy unraveled under the weight of successive scandals. After he was elected, he appointed trusted people to lower or mid-level positions in Vatican departments, where they can be his eyes and ears. For example, Pedacchio, his Argentine secretary, also works in the department that decides who will become bishops. Monsignor Battista Mario Salvatore Ricca, an Italian who runs the Vatican guest house where the pope lives, was given a position at the Vatican bank as the link man between a supervisory commission of cardinals and the board of directors. "He is sometimes like the leader who says 'I don't care what the generals say, I will tell Lieutenant so-and-so to take that hill'," said a source, adding that the pope enjoyed rattling an inefficient bureaucracy with what the source described as "joyful destruction". Several of those interviewed said Francis puts much stock in his immediate gut feelings about people. When he takes a liking to someone he can become blind to their faults and when he does not, it is hard to reverse that first impression, they said. Francis was impressed by Cardinal George Pell of Sydney when he met the Australian in 2013. In meetings cardinals held among themselves before that year's conclave, the former Australian Rules football player stood out not only for his height and broad shoulders but also for his command of financial matters. Months after his election, Francis, hoping to put an end to Vatican financial scandals, moved Pell to Rome to head a new ministry, the Secretariat for the Economy. After initially giving him sweeping powers, the pope later significantly trimmed them back when other departments accused Pell of treating them in an overbearing way and of being condescending to the Italian-dominated curia. Pell's position in the Vatican has also been weakened by allegations of sexual abuse when he was in Australia. Pell denies the allegations and the pope has said he will withhold judgment until an Australian investigation is over. In another controversial appointment, Francis, acting on a recommendation, named Francesca Chaouqui, a 32-year-old Italian public relations expert, to a commission advising him on reform. On July 8, 2016, a Vatican court convicted her of helping to leak embarrassing internal documents to journalists. Insiders say the Pell and Chaouqui cases are examples of Francis making decisions too quickly. Even though his health is good, they say he feels he has little time left and many things still to do; that perhaps explains the hastiness of some of his decisions. Francis appears to enjoy sending signals that he alone is calling the shots. 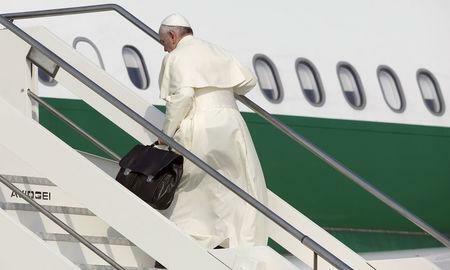 When his predecessors spoke to the media on papal flights they were always flanked by the secretary of state or the deputy secretary of state. The stage management suggested that behind the man in white, there stood a centuries-old bureaucracy. 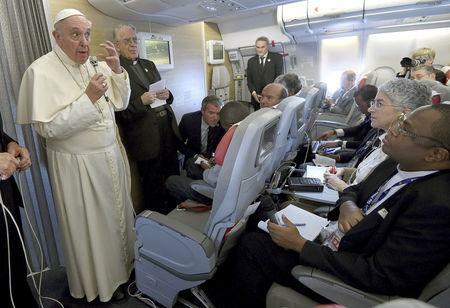 Under Francis, those prelates now stay out of sight in the front section of the plane.